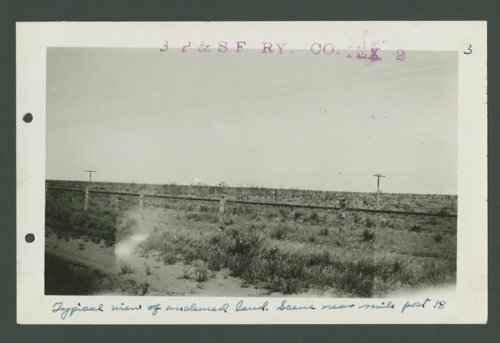 These four photographs show views of the South Plains & Santa Fe Railway Company line. The rail line, a subsidiary of the Atchison, Topeka & Santa Fe Rail Company, ran from Lubbock, Texas to Bledsoe, Texas. The first photograph shows a view of tracks near mile post #18. In the second photograph a view of a typical pile trestle bridge is visible. The third photograph shows a view of tracks near bridge 10-A. The last photograph shows an open deck pile trestle bridge with rails.